Solar guitar duo are based in Brighton and perform throughout the UK and Europe. They are very much in demand for all types of occasions including corporate events, weddings, parties and more. 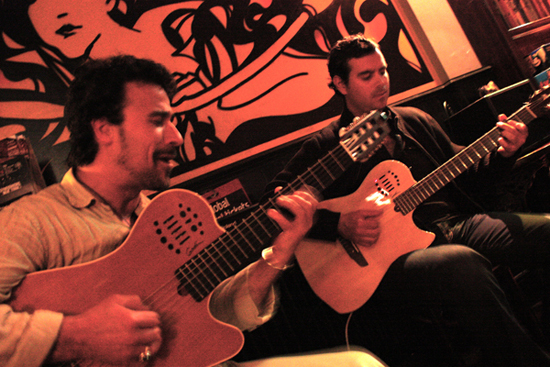 Their vast repertoire consists of jazz through to Brazilian Samba and Bossa Nova. The jazz side spans classic standards by Gershwin, Porter etc via Parker style be-bop through to more contemporary composers such as Chick Corea, Keith Jarrett and Pat Metheny. The classic Brazilian repertoire is also covered from composers such as Antonio Carlos Jobim and Luiz Bonfa through to interesting classical style “Choro” pieces. Other South American styles are also performed such as Venezuelan waltzes and Argentinean folk pieces. Solar duo weave intricate, beautiful melodies and improvisations over exciting swing and Latin rhythms providing the perfect atmosphere for any occasion.